In this case, their defaults I think make sense. 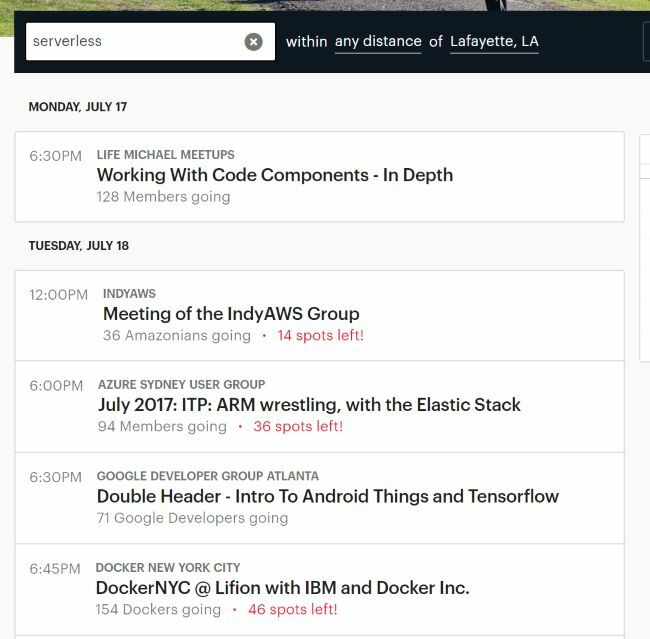 As an evangelist, I’m looking for meetups I can speak at (hey, by the way, I’d love to speak at yours! ), so my use case is not the norm. But I was also a bit bugged by the fact that I couldn’t limit my searches to America. Therefore - I decided to do what any good developer would do - spend 10x as much time writing my own solution versus just dealing with what was given to me! 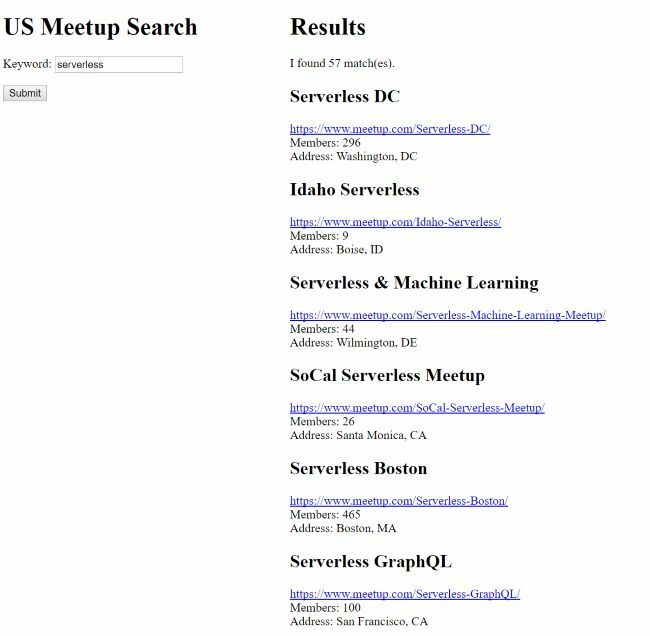 I knew Meetup had an API and I blogged on it a few years ago (Using the Meetup API in Client-Side Applications), so I figured this would be a great example of how I could use serverless, and OpenWhisk in particular, to build my own API wrapper around their data to build my own tool. Here is the action I created to wrap their API. in for the time being. quite work. SO let's fix that. For the most part, this is simply building a URL based on arguments. I’m not doing any validation since the API will do that for me. I’m also not doing any pagination since in my testing, I got over 100 results. I couldn’t find docs on how many max results they would return and I did do a bit of “prep work” for adding support in the future, but for now, it will return at least 170 or so results in my testing. Note that the action expects an argument for the key. I set that as a default action parameter so I don’t have to include it in my own calls. The only real interesting part is the manipulation I do for “country”. While the Meetup API has a country argument, it seems to ignore it when you set the radius argument to global. So basically, I can’t say “Don’t care about distance from my home but keep it to America.” Therefore I do my own filtering on the results after fetching them. This is a great example (imo) of where serverless wrappers can be so useful. I took an existing API and built my own to address the shortcomings (or at least my perceived shortcomings) of it. You’ll notice my URL constant on top sets up a bunch of defaults and when the actual search is performed, I’m just adding a keyword. 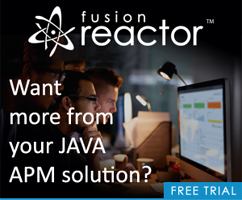 The “action” folder contains my action code (one file) and “client” contains the client-side application that uses the API on OpenWhisk.